The most spectacular skies I saw over the past seven days were when I was driving and couldn't take a picture. One morning when the moon was full, I saw the moon through my windshield ahead of me and behind me a golden sunrise looks more like a spaceship chasing me than the sun. 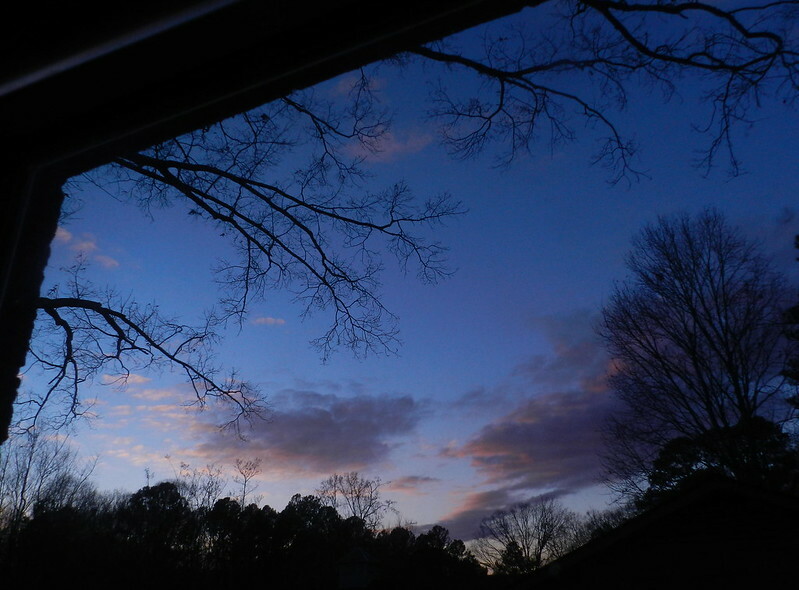 Since it was too dangerous to photograph the sky while driving, I'll settle for a shot I took tonight at the end of the day through my bedroom window. What a lovely deep blue! I hate to miss good photos too -- but remember when we were just happy to see a pretty sky or an interesting bird? Now I feel disappointed if I don't get the picture. Ah well, the joys and sorrows of a digital camera. The picture you did get -- through your window -- is definitely nothing to be disappointed about. Beautiful blue, lovely angle. What a wonderful night sky - right from your window. Such a glorious night sky and what a view it is indeed to have right from your window!! Thanks, as always, Carver for sharing the beauty of your skies! Have a wonderful Christmas!! Beautiful blue sky and a wonderful composition, Carver. Great skywatch! Enjoy your weekend! Beautiful blues in this sky shot! I can totally relate... saw a number of good moon and sun shots this week, but unable to photograph them for a variety of reasons. Your window view is very lovely! So very pretty! Nice view!